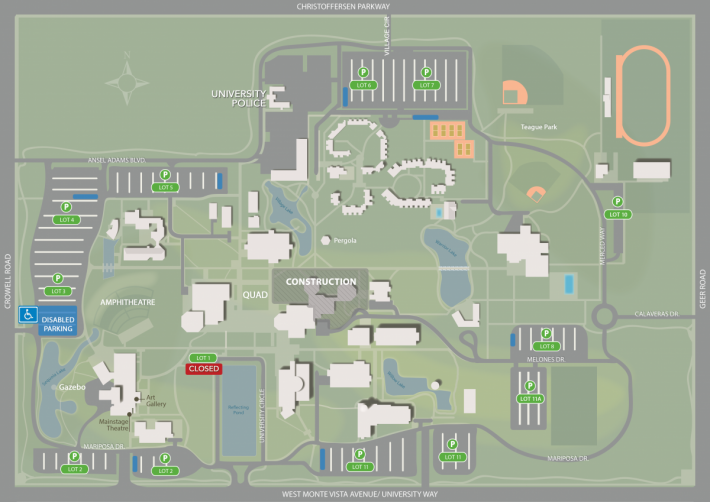 Complimentary parking will be available on campus for Commencement. Public Safety officers will direct guests to the most accessible lots. To avoid being ticketed, please do not park in unauthorized spaces or in off-campus lots. Designated Disabled Parking spaces are available for automobiles displaying the appropriate placard. Shuttle service from the parking lots to the amphitheatre will be provided for physically challenged guests. If you need special accommodations or have questions about the physical access provided, please call (209) 667-3598 in advance of the event date. Guests and visitors, please see Guest Seating & Etiquette for additional information.